Radio & Battery Charger Desktop Organizer Station. No need to purchase pods. Mix various radios on one charger. 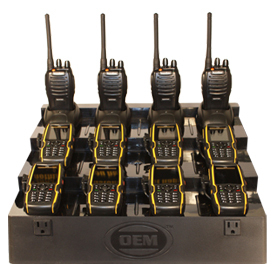 Charge radios with other electronics. Gross weight only 3.9 pounds (1.8 kilograms). FuelPad-12™ Simplicity: 1 outlet cable. 12 positions. Low cost.